Parama Rupa das is a spiritual advisor at the Northeastern University, a visiting lecturer at the Tufts University and an engineering manager at the MathWorks. 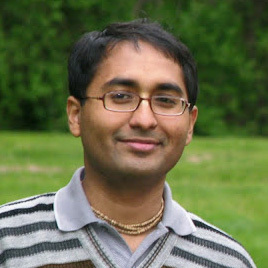 He graduated from the Indian Institute of Technology (IIT) and eventually received his Ph.D. in Computer Science from the University of California, Irvine (UCI). His deep faith in spiritual principles is a result of seeds that were sown when he was 10 years old. Since then, he has inculcated habits of regularly reading scriptures and practicing meditation. His practices and realizations matured as he got opportunities to receive directions from various qualified teachers. He was fortunate to receive a formal initiation from a renowned spiritual master and guide, His Holiness Romapada Swami. Having benefited from applying the jewels of spiritual wisdom contained within the bhakti tradition, he finds great pleasure in sharing these practices in the form of presentations and workshops at Universities and other forums.